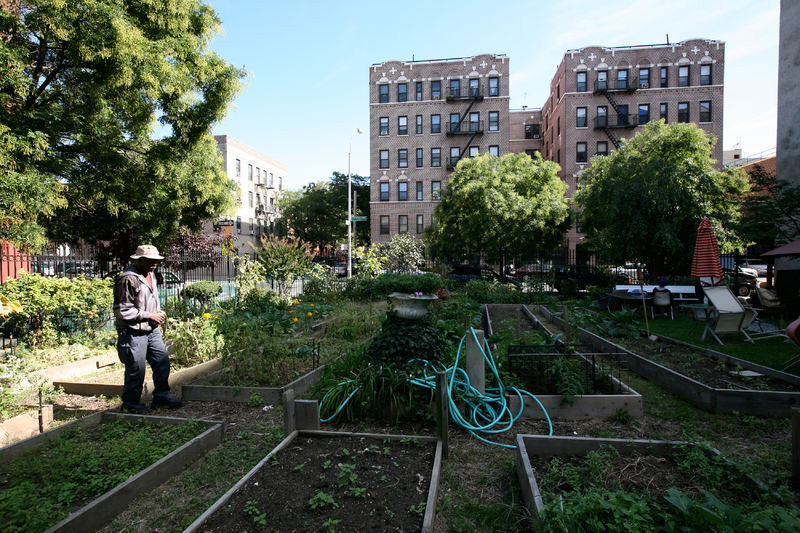 In a world of asphalt and brick, New York's more than 450 community gardens provide residents rare places to relax and connect with nature. They serve as front porches and backyards—places to meet with neighbors, play, grow produce, and gather for summer cookouts. The majority of gardens were created in the 1970s and '80s, when residents of poor, minority neighborhoods began taking over abandoned lots, clearing rubble to plant beds, and grow vegetables. The city, having little use for the vacant properties, granted the gardeners temporary leases through the parks department's GreenThumb program. In 1999, in search of revenue, the city sought to auction off many of the garden properties. But in an eleventh hour deal, The Trust for Public Land negotiated the purchase of 64 community gardens from the city auction block, and with the subsequent donation of an additional five gardens, saved 69 gardens from destruction. Since that time, we have overseen a process that has enabled the gardeners— for the very first time—to own and control their garden plots. To accomplish this, we organized and trained leadership for three borough-wide land trusts in Manhattan, Brooklyn-Queens, and the Bronx. The process has created a corps of civic leaders committed to community-owned urban green space, managed by the people for the people, and to using those spaces to better the lives of those they serve. The summer of 2011 saw the transfer of 32 of the 69 gardens to the hands of the people they serve. This fall TPL expects to transfer the remaining gardens to the Brooklyn-Queens Land Trust. To date, TPL has invested more than $4 million in improvements to the 69 gardens, which cover nearly eight acres and are worth more than $7 million.